US Open champion Naomi Osaka shed further tears as she discussed why she had cried at the end of her dramatic final victory over Serena Williams. The 20-year-old Osaka achieved a hugely significant feat in New York on Saturday, beating Williams 6-2 6-4 to become Japan's first grand slam singles champion. ​However, her magnificent performance was cruelly overshadowed by an extraordinary row between Serena and chair umpire Carlos Ramos, which started with the American taking objection to a code violation for coaching and culminated in Williams being docked a game as she continued her protests after being penalised for racquet abuse. Amid hostile scenes in Arthur Ashe Stadium, Osaka held her nerve superbly to prevail, but was understandably emotional in the presentation that followed and even apologised to the crowd for denying her idol a record-equalling 24th slam singles title. When she was asked in a news conference why she had said sorry to the spectators, Osaka teared up again and responded: "Your question is making me emotional." Amid pauses to regain her composure, she added: "I know that she [Williams] really wanted to have the 24th grand slam, right? Everyone knows this. It's on the commercials, it's everywhere. "But then when I hugged her at the net, I felt like a little kid again." Osaka has frequently stated her admiration for Williams, while her father was inspired by the way Serena's dad, Richard, devised and executed a plan to turn his two daughters into champions. The new champion at Flushing Meadows could perhaps be forgiven for being angry at the fact her triumph was overshadowed. 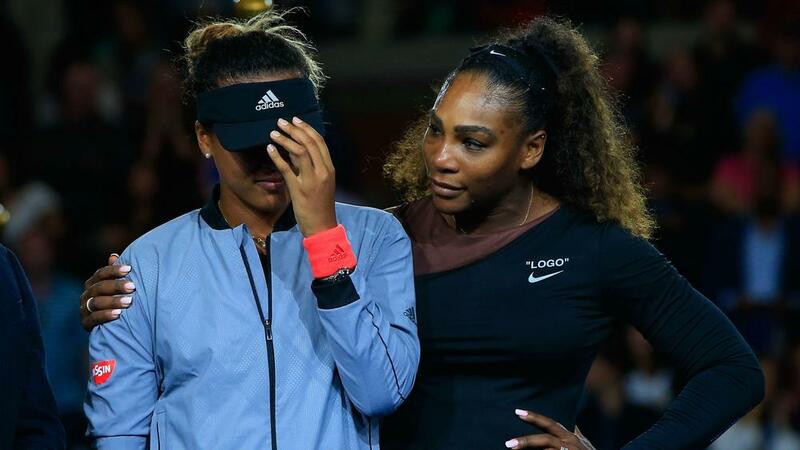 However, Osaka refused to condemn Serena and claimed, somewhat improbably, she was not fully aware of the drama that unfolded as the row between Williams and umpire Ramos escalated. "I don't know what happened on the court. So for me, I'm always going to remember the Serena that I love," said Osaka. "It doesn't change anything for me. She was really nice to me at the net and on the podium. I don't really see what would change."